It seems there is a good chance we will never see a rematch take place between Genandy Golovkin and Canelo Alvarez – at the very least, there is a big chance we will not see it take place this year as was, seemingly an age ago now, originally planned. The two had agreed to fight in May, in a huge rematch of their March 2017 draw, but Canelo then stunned the sport by twice testing positive for an illegal substance, being suspended for six months as a result. READ Gennady Golovkin Turns 37, How Much Has The Former Middleweight King Got Left? Naturally Golovkin, and his promoter Tom Loeffler strongly disagree with the claims of the middleweight king being scared – of anybody. Loeffler, also speaking with Ring, said that due to all that has happened – with the May 5 fight falling apart through no fault of his fighter – a better deal is being sought for a September fight. 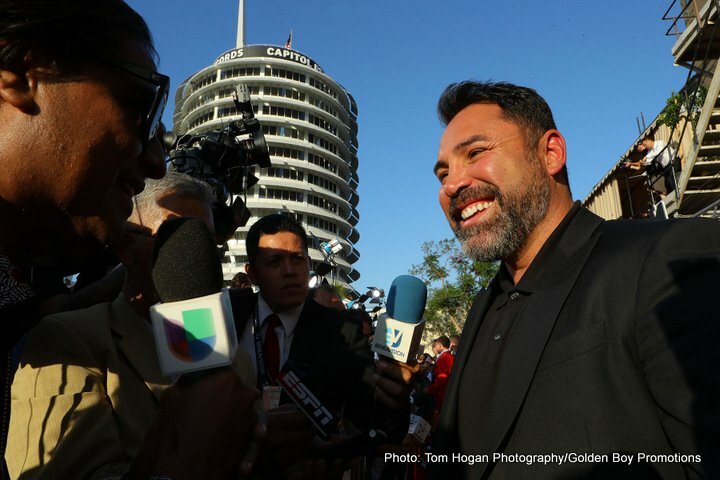 De La Hoya though, says he will not budge on the original May 5 deal that GGG accepted back before Canelo got busted (Alvarez still insisting as he is of being a clean and innocent fighter). It looks then, as though GGG and Canelo will both fight someone else next. Billy Joe Saunders may prove to be the lucky man in all of this, as he is being looked at as a potential foe for both stars. The WBO 160 pound champ has said many times he wants to fight GGG and Canelo, now (providing he gets past Martin Murray next month) the unbeaten southpaw may get his chance and with it the chance to pick which man he wants to fight first. But who is to blame if we never get to see GGG and Canelo settle their unfinished business? GGG supporters will say the unbeaten champion has a perfect right to ask for more money for a return due to how he made, as Loeffler says, “a lot of [financial] sacrifices for the first fight and for the rematch.” But Canelo supporters will say that as GGG accepted what was offered for May 5, he should not change his mind now.